The first daylily bloom appeared this morning. It is no doubt a 'Stella D'Oro', which should bloom all summer long to the point that I'll likely not notice them along the edge of my patio after awhile. They will be a background to the rest of the garden. These were some I had dug and divided this spring and I'm glad that has not kept them from blooming. I'd be more proud of this first bloom if I had not stopped at my sister-who-does-not-garden's condo yesterday to put a few small trellises in a couple of pots with sweet potato vine growing in them. They have a whole row of these already blooming by their condo. I consoled myself that those daylilies are along a south facing wall, so the soil there probably warmed up a lot faster. I will further console myself in large bowls of home grown lettuce. Look at all that lettuce. How shall I eat it all? In salads, on sandwiches, as snacks! I have lots of lettuce to eat and also some spinach. The spinach is buried under all that lettuce, I promise. It has been YEARS since I've harvested any spinach from the garden, though I try to every year. Usually the bunnies get to it first. But not this year! I don't know what is different, except the neighbor's cat, Jake, comes to play in my back yard occasionally. It almost makes me want to get a cat. Almost, but not quite. Why have a cat if I can borrow the neighbor's to chase off the rabbits? Have a great day in your garden today. It's interesting that your daylilies have started to bloom at the same time as mine, despite the geographical distance between our gardens. Is this normally when your daylilies bloom? Carol, that flower is gorgeous, and that lettuce (and the spinach underneath) looks thrilling! Enjoy that bounty. I'm very jealous of that lettuce. I'm getting to my veggie garden late this year because I'm redesigning it with all my spare time, Ha Ha! Hi there! Yummy looking lettuce - the kind that needs no dressing. If you feel overwhelmed with it, you know where you can send the overflow! Everything looks fabulous. I also use lettuce as wraps. I stuff it with all sorts of filling. Love the Stella D'oro. Great picture! No buds on mine yet. Pam/Digging... Unfortunately as spring continues, my record keeping lapses terribly, so I can't say for certain if this daylily is blooming earlier than normal. Genie...Thanks for the comment and I'll be enjoying the lettuce for quite awhile. Chigiy...I haven't planted the rest of my vegetable garden, so you might catch up with me, yet. Sister with the Homestead...I'll remember! Opal:Vegan Mom...I'll have to try lettuce wraps sometime. Jean... I'm sure you will soon have some daylilies in bloom. Wow, Stellas already? You should be proud. Mine are weeks away from bloom. All that beautiful lettuce has me craving a salad! The daylily is beautiful. mine don't have buds yet but they're nice and leafy so I know they are doing well. 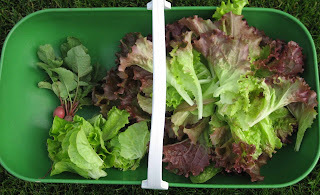 Your lettuces look wonderful. What's your secret to growing spinach (before the bunnies get it)? Mine seems to be growing extremely slowly. Our neighbours own a dog and I rarely see the neighbourhood bunny(s) but this year they seem bolder or my onions seem tastier? However they have left my pea shoots alone. In fact, they seem to have feeding spots? Squirrels, around our parts, seem to vary in how destructive / hungry they are from year to year. 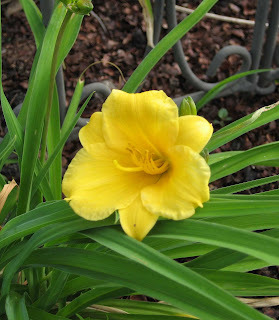 I noticed a bud on one of the stella d'oro daylilies today. They're on the south side of my house, so you can see, it's quite a bit chillier where I live. The stella has such nice foliage! I'm not a big fan of school bus yellow but others always rave about this daylily so I do have a few and the first bloom is always so welcome! I don't particularly care for daylilies I do have the Stella D'oro at the front walkway a clump that is reliable as you say so I leave it.I prefer the exotic lily like stargazer.casablanca my fav.! Daylilies already? Pam had some too I noticed. Oh sighhhhhhhhhh... Home grown lettuce already!!! Lucky you. I have two cats and a dog, but I still was compelled to fence the rabbits out of my vegetable garden. I have Stellas blooming too, they just started last week while I was on my road trip. I have lettuces going as well. We have lettuce and spinach all winter, as well as beet greens and arugula and kale because we have a couple of cold frames. I highly recommend investing in a nice one with automatic openers. It makes the winter salad commonplace here, so I don't end up with a lot of lettuce envy of other people. Elliot Coleman in his book "Four Season Harvest" gives quite good instructions on how to have fresh vegetables all year round. Wow, same zone as me, and you have a daylily bloom already?? And lettuce! Well, despite not having rain in so long, we had too much of it early on, so we didn't get the early veggies out very early. :-( It will be awhile yet. I can't wait to eat spinach right from the garden!